Delphi was really amazing and should be a priority on any visit to Greece. A little bit of advice can usually go a long way, so here are some tips to make sure you enjoy your visit. I was warned (by a man in Athens no less) that the Delphi museum had odd hours. This was strangely confirmed when the three recent guidebooks I consulted all listed different hours for the museum. Once in Greece, I called ahead and found that the museum was closing at 3pm the day we wanted to go. We had lunch on the run in Thermopylae and made it to Delphi with a hour for the museum. Since the archaeological site itself is open from ~8am-8pm everyday, we saw bus loads of tourists dropped off just to look at the ruins because the museum was long closed. I’d have felt a little cheated if I came all that way and didn’t get to see the famous Charioteer statue, the architectural decorations and votive objects in the museum! 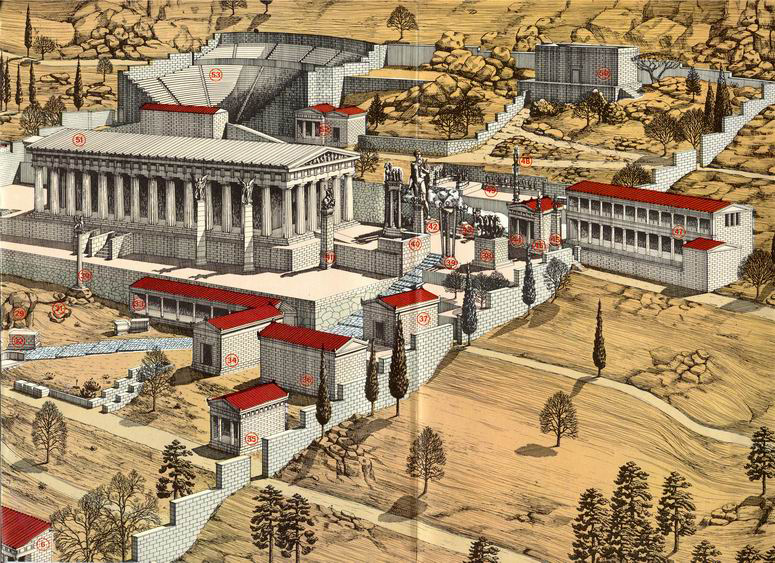 Delphi is a lot bigger than you think it is and built on a steep hill. If you really want to see most of the site and enjoy the staggering vistas, budget 4 hours at least to see Delphi. I suppose you could run through it quickly and just see some parts but you wouldn’t have time to start mentally piecing all the ruins together. It’s hard to approach a large archaeological like Delphi, which contains almost no complete buildings, and immediately grasp the scale. It’s pretty rewarding to sit at different vantage points and imagine the ancient city. I was hoping that things would begin to cool in early September but it was still incredibly hot in Delphi. Since there is very little shade, try to go first thing in the morning or in the afternoon (3-8pm) like we did. Take breaks, wear a hat and drink lots of water. 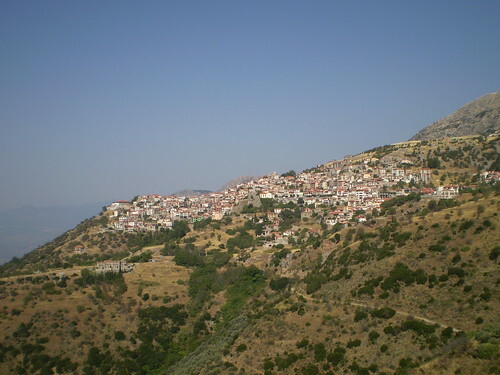 Arachova is about 20min east of Delphi and is a lovely town. What spares Arachova from the cheesy tourist malaise down the road is its status as a top winter destination for skiers who flock to Mt. Parnassos. Arachova has great hotels and restaurants to serve the influx of mostly Athenians coming up to ski but is empty in the summer months. 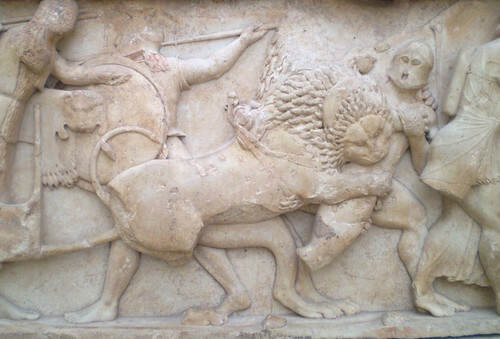 Since the city draws Greek sports enthusiasts, you are spared the kitsch seen in Delphi. Arachova was a beautiful, peaceful town without the crowds and a more authentic place to hang out . 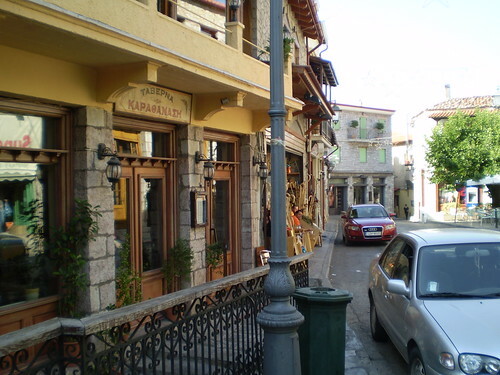 There are several nice hotel options; we stayed at Xenonas Iresioni‏. It is on the edge of town but only a few minutes walk away from the center of things. The staff was great and the room was comfortable with the biggest double bed we saw in all of Greece. When I mentioned to the man at the front desk that I was unable to purchase a Delphi catalog because the museum shop had run out of the English version, he gave be an unused one that they had on hand. Talk about helpful staff! Thanks for the tips! I wouldn’t have guessed about the museum hours – I’ll have to make sure we check out what they are when we get there next week!